Shandling was born Garry Emmanuel Shandling in Chicago, Illinois on November 29, 1949. He was raised in Tucson, Arizona. He studied at the University of Arizona. 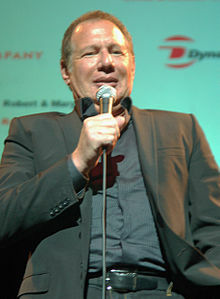 Shandling began his career in 1975. He started writing for sitcoms such as Sanford and Son and Welcome Back, Kotter. He began his career in comedy when he was on The Tonight Show Starring Johnny Carson and was on the show many times. Shandling was for a thought to replace Carson (other hopefuls were Joan Rivers, David Letterman and David Brenner). In 1986 he created It's Garry Shandling's Show, for the pay cable channel Showtime. It was nominated for four Emmy Awards (including one for Shandling) and lasted until 1990. His second show, The Larry Sanders Show, which began airing on HBO in 1992, was even more successful. Shandling was nominated for 18 Emmy Awards for the show and won the Primetime Emmy Award for Outstanding Writing for a Comedy Series in 1998, along with Peter Tolan, for writing the series finale. In movies Shandling had a the same role as Senator Stern in the Marvel Cinematic Universe, appearing in Iron Man 2 and Captain America: The Winter Soldier, as well as a voice in DreamWorks Animation's Over the Hedge. His last movies were Captain America: The Winter Soldier (2015) and The Jungle Book (2016). Shandling was in a relationship with Linda Doucett from 1987 through 1994. He lived in Los Angeles, California. Shandling died in Los Angeles from a pulmonary embolism caused by thrombosis in his leg on March 24, 2016. He was aged 66. During his career, Shandling was nominated for 19 Primetime Emmy Awards and two Golden Globe Awards, along with many other awards and nominations. He served as host of the Grammy Awards four times and as host of the Emmy Awards three times. ↑ "Garry Shandling, Star of Groundbreaking Sitcoms, Dies at 66". The New York Times.com. March 24, 2016. Retrieved March 25, 2016.